Rheumatoid arthritis is a common but often debilitating disorder. Given the intricate and challenging nature of treating rheumatoid arthritis, it is imperative to educate physicians on the disease's initial symptoms and complications, as well as to provide accurate and up-to-date information regarding effective treatment. Designed to help eradicate misconceptions concerning rheumatoid arthritis and its treatment, this concise volume helps clinicians to understand and then effectively diagnose and treat patients with the condition. Part of the Oxford American Rheumatology Library, this concise guide serves as a practical, user-friendly reference for rheumatologists and other healthcare professionals. 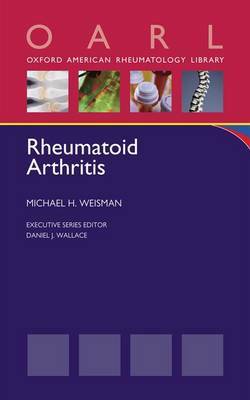 The book provides an overview of rheumatoid arthritis, including its epidemiology, symptoms, signs, and pathophysiology. Using the most current information available, the author evaluates both traditional and innovative treatment methods. A thorough glossary defines key terms and the appendix includes related resource information - associations, journals and doctors/researchers - all devoted to the study and treatment of rheumatoid arthritis.